When Google launched Chrome, the selling point Google advertised was that it was light-weight. The key word is ‘was’ because it no longer is, and Google is well aware of that. It didn’t end with that, Microsoft went ahead and shamed Chrome in front of its peers by making this video as well – also using the Surface Book. They also wrote a whole blog post about it with graphs and everything! Now that might be fun for Microsoft; it can be quite insulting for Google. However, Google has been quite busy removing features from Chrome recently – and optimizing the ones they cannot remove. And to show their progress over the past year, they have made a video… on a Surface Book. As we can see, Google’s hard work has somewhat paid off. Google played the same Vimeo video on two identical Surface Book’s and ended up having a whole 2 hours and 12 minutes of extra battery life. Chrome v46 from 2015 lasted for 8 hours and 27 minutes while Chrome v53 from 2016 lasted 10 hours and 39 minutes. There is an anomaly; Microsoft used Chrome v51 in the video they made back in June. It is not clear how much of an improvement Chrome v53 packs against v51. However, it is safe to assume that both companies are doing something drastically different – because the results are drastically different, despite doing the same thing at first glance. 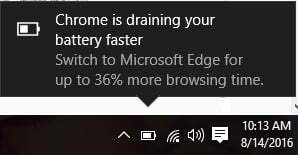 Still, Google using the Surface Book is a clear hit back at Microsoft; and while looping the same video over and over for hours is not exactly a real world test, it does show that you can get good battery life on Chrome as well.